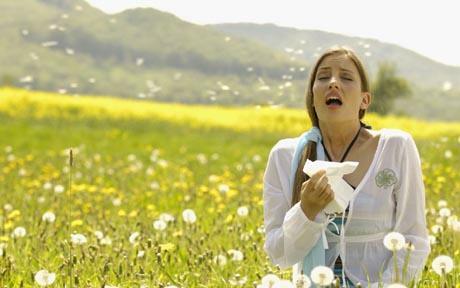 The media has recently warned of an unusually bad allergy season causing miserable symptoms to countless people. Seasonal allergies are commonly referred to as allergic rhinitis — also known as “hay fever” — if the nose is mostly affected, and allergic conjunctivitis if the eyes are involved. Allergic rhinitis affects up to 40 percent of children and 10 to 30 percent of adults in the United States. It is referred to as “seasonal” if symptoms occur at particular times of the year or “perennial” if it occurs year-round. Common symptoms of seasonal allergies include sneezing, itchy eyes, nasal congestion, headache, and fatigue. These symptoms can have a tremendous negative impact on the quality of life and on productivity. American workers lose an estimated six million work days yearly to this disorder, as well as incurring costs of several billion dollars in medical care. Seasonal allergies usually occur from spring to early fall, and are due to pollens from trees, grass and weeds. Perennial allergies, occurring throughout most of the year, are caused by indoor factors such as dust mites, animal dander, and mold. Nasal stuffiness from allergic rhinitis can cause swelling and obstruction of the sinuses which can lead to a sinus infection. There is a strong association between allergic rhinitis and asthma. Up to 50 percent of patients with asthma have allergic rhinitis. Sleep disorders in adults and a high proportion of ear infections in children are also associated with allergic rhinitis. Treatment for people who think they have allergic rhinitis can begin with an over-the-counter antihistamine such as Benadryl or Chlortrimeton. However, they are often associated with the bothersome side effect of drowsiness. They should be avoided in children below 2 years of age and in the elderly. Newer oral antihistamines such as Claritin, Allegra, and Zyrtec, are now available without a prescription and cause significantly fewer side effects and are more conveniently dosed at once or twice a day. Steroid nasal sprays such as Nasacort and Flonase are very effective and are now sold over the counter. Seasonal allergies can also affect the eyes causing redness, tearing, itching, and swelling of the lids. This can be treated with cold compresses and with one of the newer oral antihistamines mentioned above. It would also be worth trying over-the-counter allergy eye drops such as Zaditor, Alaway or Naphcon A. The above mentioned over-the-counter medications for allergy symptoms can be purchased for under $30 at your local pharmacy. If these treatments aren’t working sufficiently, see your doctor who can help you decide what treatment is best for your symptoms. Allergic rhinitis, commonly called hay fever, affects as much as 40 percent of children and 10 to 30 percent of adults in the United States. It is “seasonal” if symptoms occur at particular times of the year and “perennial” if they remain year round. Common symptoms include sneezing, itchy eyes, nasal congestion with a decreased sense of smell, headache and fatigue. These symptoms can tremendously impair one’s quality of life, as well as productivity. American workers lose an estimated 6 million work days yearly to this disorder and incur costs of several billion dollars in evaluation and treatment. Seasonal rhinitis usually occurs from spring to early fall and is due to pollens from trees, grass and weeds. Perennial rhinitis, lasting throughout most of the year, is caused by indoor factors, such as dust mites, animal dander and mold. Nasal stuffiness from allergic rhinitis can cause swelling and obstruction of the sinuses which can cause a sinus infection. There is a strong association between allergic rhinitis and asthma. As much as 50 percent of patients with asthma have allergic rhinitis. Sleep disorders in adults and a high proportion of ear infections in children are also associated with allergic rhinitis. Treatment for people who think they have allergic rhinitis can begin with an over-the-counter antihistamine, such as Benadryl or Chlor-Trimeton. However, these are often associated with the bothersome side effects of drowsiness. They should be avoided in children younger than 2 years and in elderly patients. Newer antihistamines, such as Claritin and Zyrtec, are now available without a prescription and cause significantly fewer side effects than the older antihistamines. They are also more conveniently dosed, at once or twice a day. Intranasal steroids have been shown to be very effective in relieving the symptoms of allergic rhinitis with minimal side effects in recommended doses. These nasal sprays are available by prescription from a doctor. n Terry Hollenbeck, M.D., is an urgent-care physician at Palo Alto Medical Foundation Santa Cruz in Scotts Valley. Readers can view previous columns on his website, https://valleydoctor.wordpress.com, or email him at valleydoctor@sbcglobal.net. Information in this column is not intended to replace advice from your own health care professional. For any medical concern, consult your own doctor. – Avoid substances and situations that cause your reaction. – If symptomatic, try over-the-counter, nondrowsy antihistamines, such as Claritin or Zyrtec. – If still symptomatic, see your doctor for prescription intranasal steroid sprays. – If none of the above is helpful, ask your doctor for a referral to an allergy specialist. Allergic rhinitis, commonly called “hay fever,” affects as much as 40 percent of children and 10 percent to 30 percent of adults in the United States. It is called seasonal if symptoms occur at particular times of the year or perennial if it occurs year-round. Common symptoms include sneezing, itchy eyes, nasal congestion with a decreased sense of smell, a headache and fatigue. These symptoms can have a tremendous negative impact on quality of life as well as productivity. American workers lose an estimated 6 million work days yearly to this disorder and incur a direct and indirect cost of several billion dollars in evaluation and treatment. Symptoms for some children may decrease as they reach adulthood, and adults’ symptoms often improve as they age. Symptoms develop when a previously sensitized person breathes in allergens. An allergen is defined as something you are allergic to. Allergic rhinitis can be divided into several categories. Seasonal rhinitis usually occurs from spring to early fall, caused by pollens from trees, grass and weeds. Perennial rhinitis, occurring throughout most of the year, is caused by indoor allergens such as dust mites, animal dander and mold. An interesting fact for those who are allergic to cats is that the allergy is caused by protein particles of the cat’s dry saliva on its fur, not actually from the fur itself. The poor acacia tree, because of its high visibility, gets a bad rap, as many people falsely claim to be allergic to it. It is actually low on the allergy scale, because the pollen is heavy and drops to the ground, whereas the less noticeable oak and olive trees are pollinating at the same time and are the more likely culprits. Living in Santa Cruz County is tough on allergy sufferers; the wonderful climate we love so much supports pollen in the air almost year round. Nasal stuffiness from allergic rhinitis can cause swelling and obstruction of the sinuses, which can cause a bacterial sinus infection. Symptoms consist of yellow or green mucus, pain in the face or teeth, headache and cough. Unfortunately for the health care provider, there is no single symptom that can help differentiate bacterial sinusitis from allergic rhinitis or even a very bad head cold. There is a strong association between allergic rhinitis and asthma. As much as half of patients with asthma have allergic rhinitis. Sleep disorders in adults and a high proportion of ear infections in children are also associated with allergic rhinitis. A careful history taken by a health care provider can most often determine what one is allergic to. A blood test called RAST can also be performed to test for allergies, but is only moderately accurate. Treatment for people who think they have allergic rhinitis can begin with an over-the-counter antihistamine. Two of the most common types of drugs in this category are Benadryl and Chlortrimeton. They are fairly good at reducing the symptoms of sneezing, runny nose and itching, but they are often associated with the bothersome side effect of drowsiness, as well as dry mouth and eyes, urinary problems and confusion. They should be avoided in children younger than 2 years of age and in the elderly. By the way, Sudafed is a decongestant, and although it may somewhat help allergy symptoms, it is indicated mostly for relief of congestion caused by colds and flu. Newer antihistamines such as Claritan and Zyrtec are now available without a prescription and cause significantly fewer side effects than the older antihistamines and are more conveniently dosed at once or twice a day. In general, antihistamines work best in people with mild to moderate symptoms and for those whose symptoms are of shorter duration. The new “gold standard” of treatment for allergic rhinitis is the use of intranasal steroids. They have been shown to be very effective in symptom relief, with minimal side effects in recommended doses. I know that many people fear the terms “steroid” and “cortisone,” but the sprays have relatively low doses, and most of the drug is deposited on the inside of the nose so that very little gets absorbed into the body. Just ask an allergy sufferer who is being treated with one of these sprays: They are usually thrilled with the results. As with the antihistamines, nasal steroids need only be taken during the time one has allergic symptoms. The nasal sprays are by prescription, so a visit to your health care provider is necessary. A health care provider may refer those with chronic allergies to an allergist, who is a medical doctor specializing in the evaluation and treatment of allergies. An allergist is likely to perform skin tests to identify what one is allergic to. Once the allergy is identified, allergy shots may given regularly to prevent or at the least to minimize symptoms. 1. Try to avoid your exposure to allergy-provoking situations or substances. 2. If symptomatic, try over-the-counter non-drowsy antihistamines such as Claritan or Zyrtec. 3. If still symptomatic, see your health care practitioner for prescription intranasal steroid sprays. 4. If none of the above helps, ask your practitioner to refer you to an allergist.